Japan has released the Monetary Policy Meeting Minutes data and the US will publish ISM Non-Manufacturing PMI, Trade Balance, Unemployment Rate, Non-Farm Employment Change and Average Hourly Earnings m/m. The support rests at 111.400 with resistance at 111.960 which both lines are above the weekly pivot point at 111.050. The EMA of 10 is moving horizontally in the ascendant channel and it is above the EMA of 200 and below the EMA of 100. The RSI is moving on the 50 level, the Stochastic is showing downward momentum and the MACD line is below the signal line in the negative territory. The ADX is not showing any clear signals. 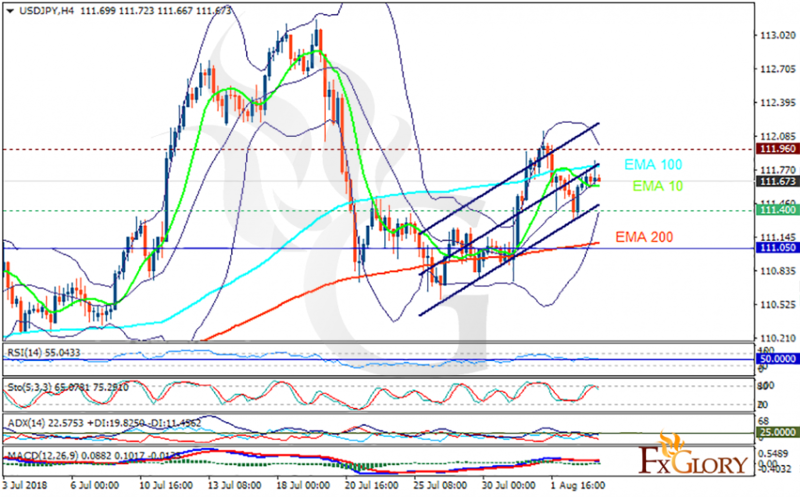 While 111 area remains the support area, USDJPY may grow towards the upper Bollinger band at 112.